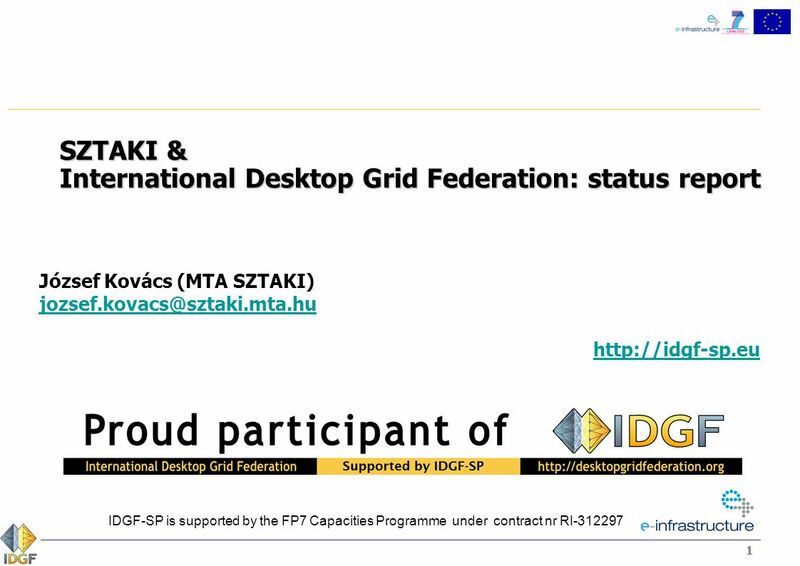 Download ppt "11 SZTAKI & International Desktop Grid Federation: status report József Kovács (MTA SZTAKI)"
1 IDGF-SP International Desktop Grid Federation - Support Project Overview London, UK, 26/9/2012 Robert Lovas, MTA SZTAKI - Project coordinator IDGF-SP. 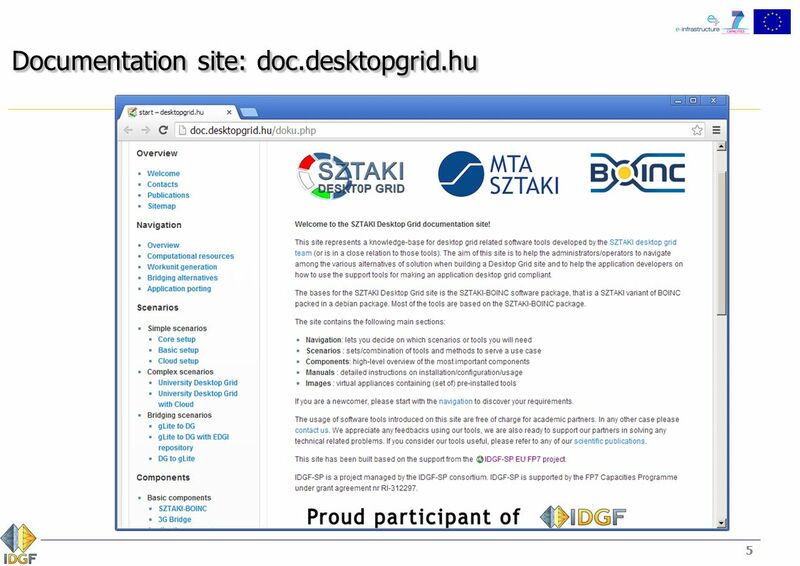 Hungrid A Possible Distributed Computing Platform for Hungarian Fusion Research Szabolcs Hernáth MTA KFKI RMKI EFDA RP Workshop. RI WP Asia 1-EPIKH School for Application Porting 1 Ловаш Р (MTA SZTAKI). Афанасьев А.П. (ИСА РАН) Волошинов В.В. ((ИСА РАН) Посыпкин. 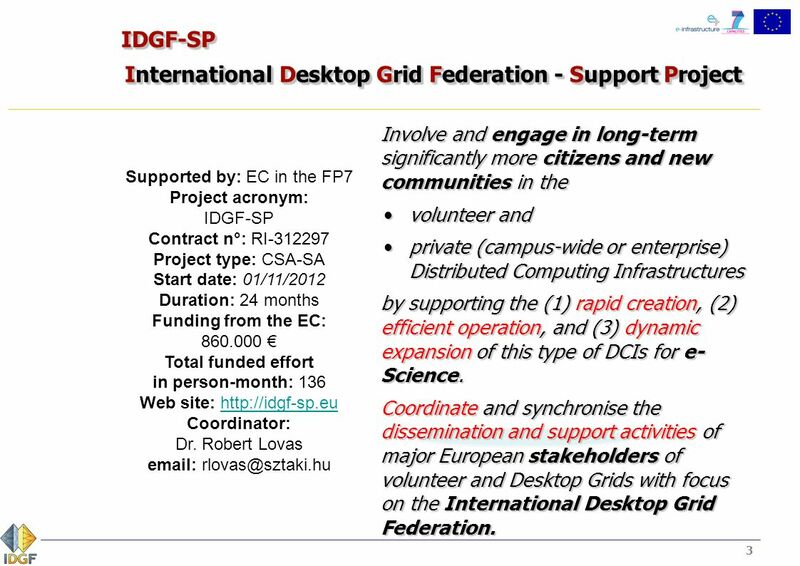 SCI-BUS is supported by the FP7 Capacities Programme under contract nr RI WS-PGRADE/gUSE Supporting e-Science communities in Europe Zoltan Farkas. 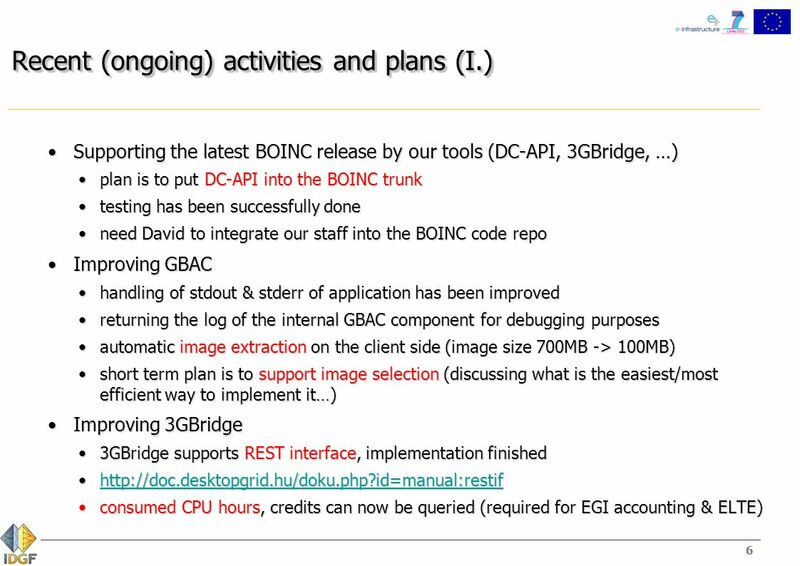 Building service testbeds on FIRE D5.2.5 Virtual Cluster on Federated Cloud Demonstration Kit August 2012 Version 1.0 Copyright © 2012 CESGA. All rights. 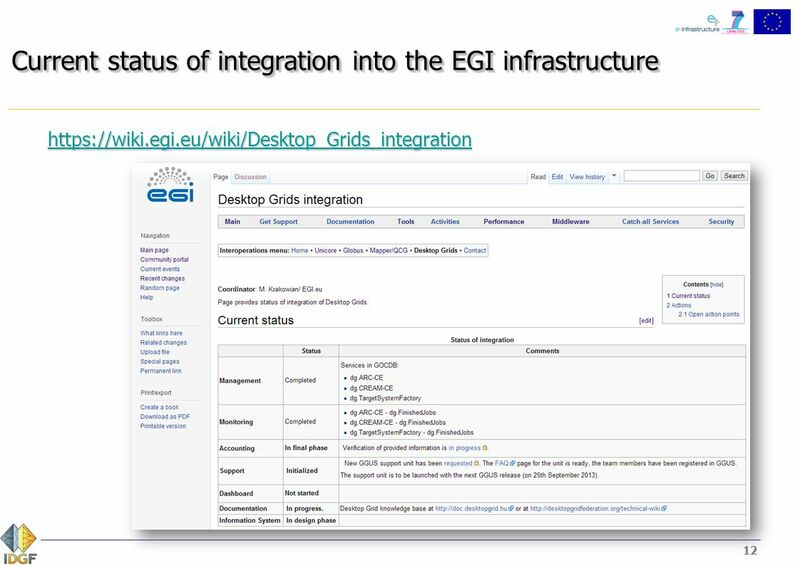 SICSA student induction day, 2009Slide 1 Social Simulation Tutorial Session 6: Introduction to grids and cloud computing International Symposium on Grid. 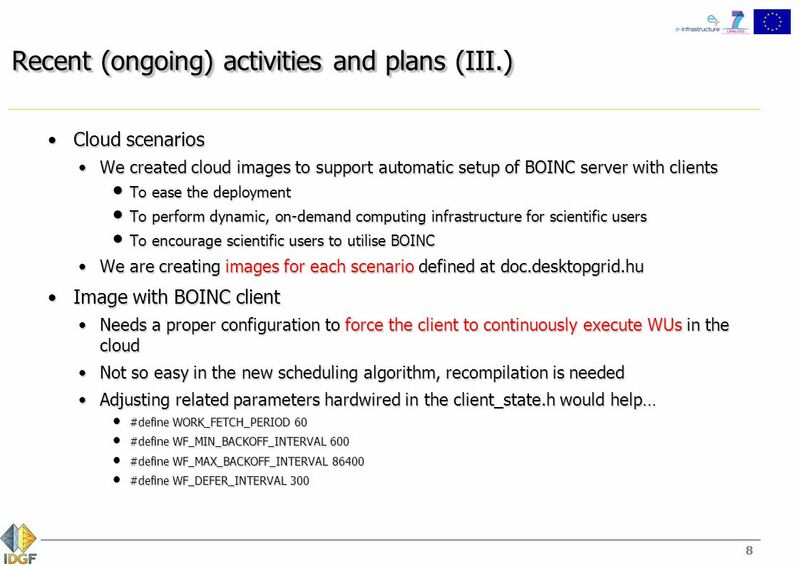 Computing for ILC experiment Computing Research Center, KEK Hiroyuki Matsunaga. 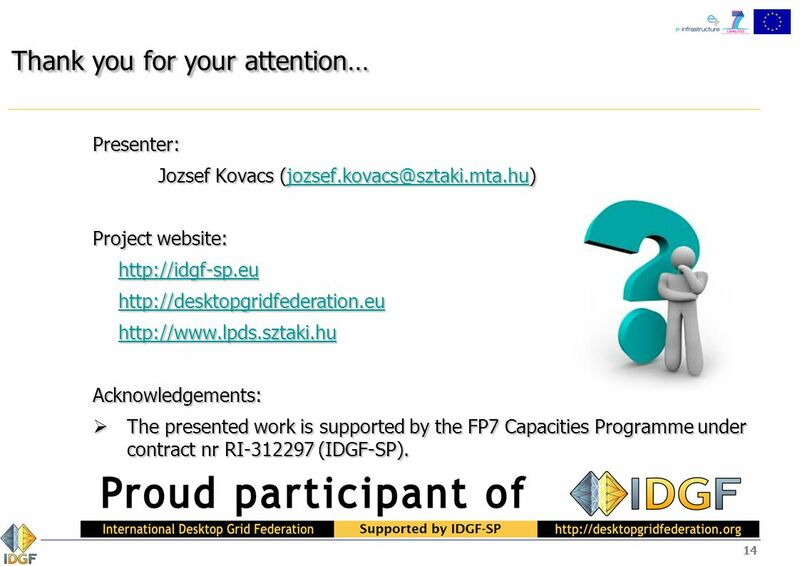 SCI-BUS is supported by the FP7 Capacities Programme under contract nr RI CloudBroker Platform integration into WS-PGRADE/gUSE Zoltán Farkas MTA. 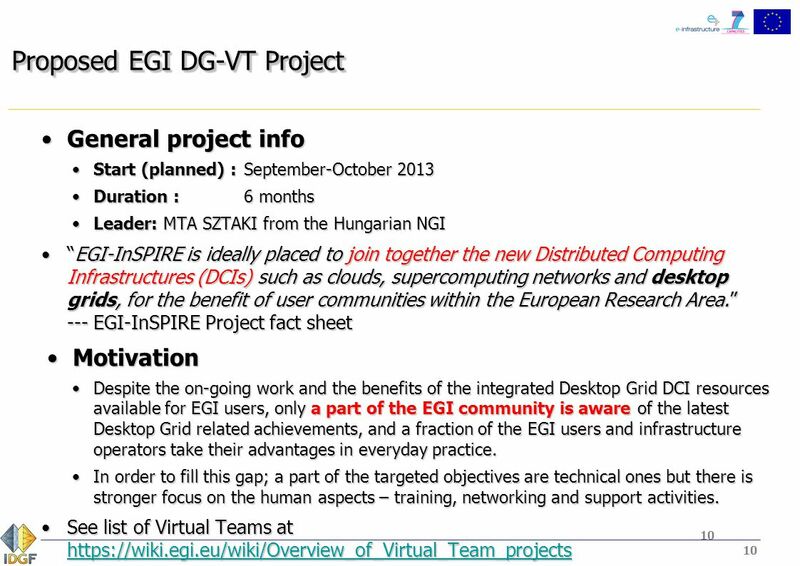 EDGI European Desktop Grid Initiative EDGI Portal usage and use-case studies EDGI is supported by the FP7 Capacities Programme under contract. 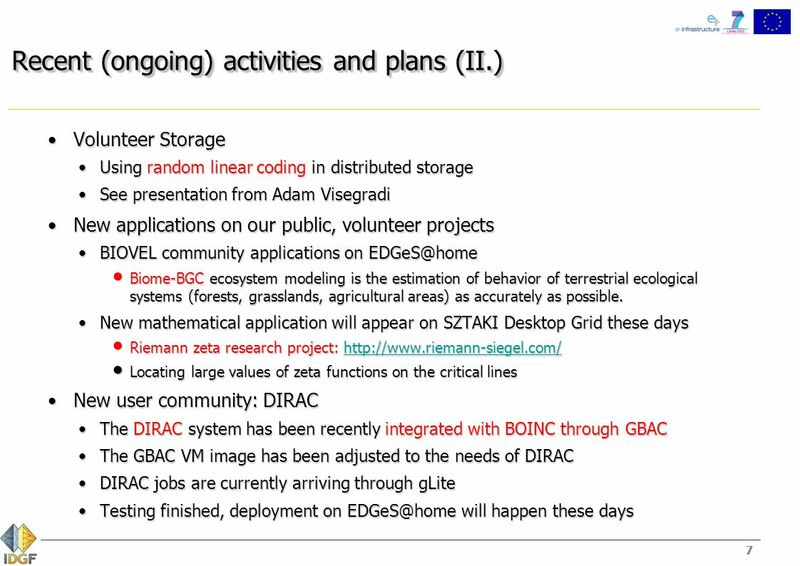 07/06/11 New Features of WS-PGRADE (and gUSE) 2010 Q Q2 Miklós Kozlovszky MTA SZTAKI LPDS. 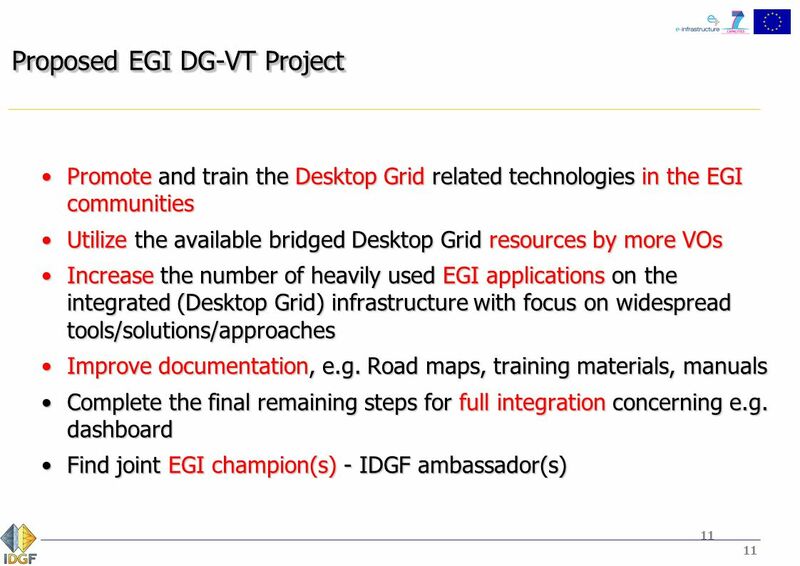 GILDA testbed GILDA Certification Authority GILDA Certification Authority User Support and Training Services in IGI IGI Site Administrators IGI Users IGI. 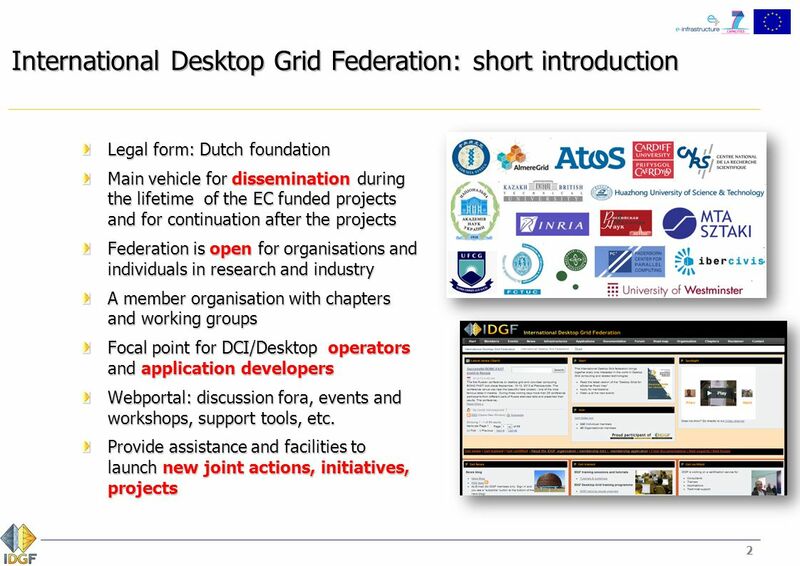 1 IDGF International Desktop Grid Federation How can you benefit from joining IDGF? 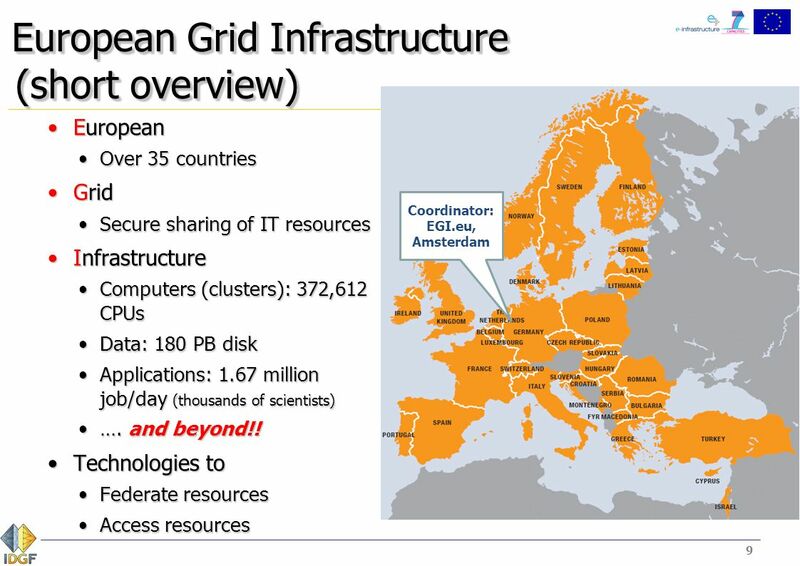 Hannover, Peter Kacsuk, MTA SZTAKI, EDGI. 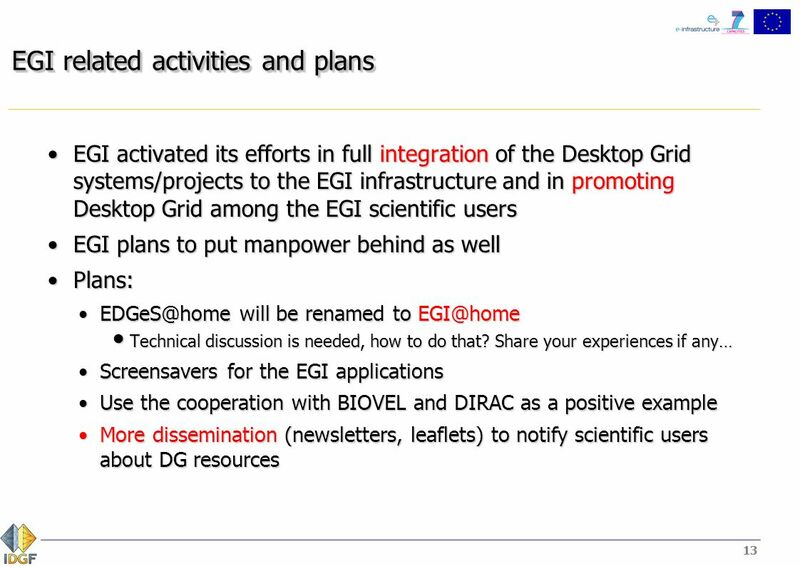 Convert generic gUSE Portal into a science gateway Akos Balasko 02/07/2012 1.